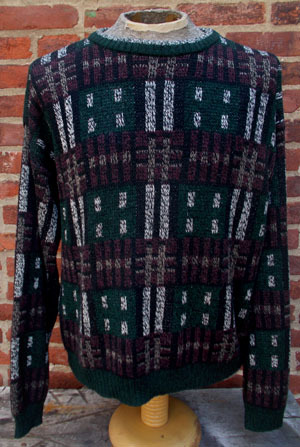 Vintage 1980s COSBY sweater! 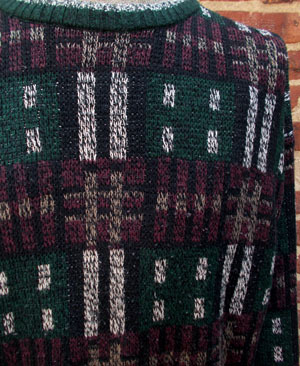 This big comfy pullover has shades of Dark green, Deep burgundy, White, Gray, Light brown and Black, arranged in a classy geometric pattern of squares and lines. The White-Gray really pops out against all those more subdued, darker colors. Ribbed Collar, Cuffs and Hem. Collar has a strip of the White-Gray at the top. Made by Michael Gerald. 100% Acrylic. Condition: Very Good. a little bit pily. priced a tad lower accordingly.